The second Iraq War was "unfinished business" from the first Iraq War. Part of the American psyche must have felt guilty about how the first war ended with Saddam still in power. The first war was mostly about oil. Back in the 1970s, President Carter spoke about the danger of lifestyles and economies dependent on "a thin strand of oil tankers stretching half way around the Earth." 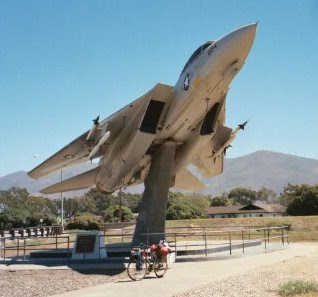 Above photo is display of old jet near Point Mugu base in southern California. Seen during my 2003 bicycle trip down the west coast. Persian Gulf wars were being predicted clear back then. One of many factors that have lead to these wars has been concern over stability of world oil supplies. There have been some other factors as well. If all the money we spent on war was put into alternative energy, transit and changing lifestyles, things might be much better. Instead, in recent years, there has been a strong guilt feeling, among Americans especially, over the human rights abuses of Saddam Hussein. A feeling that we should have really, "finished the job and taken him out in the 1991 Gulf War" was pervasive. Our oil dependency fuels our perception of being "the keepers of the Middle East." "You break it, you buy it?" *Today's flurry of essays comes from reorganizing other parts of my site.